Andalusite gems captivate the eye by exhibiting an exquisite array of vivid colours which shift iridescently when it is viewed from different angles. While traditionally not very well known, this strikingly beautiful mineral is increasingly gaining in popularity amongst jewellery enthusiasts and designers for its exotic appearance. 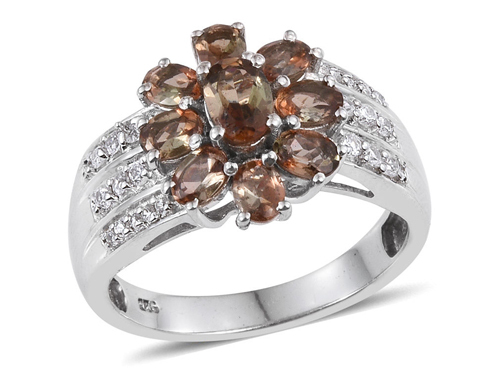 Andalusite was named after the first place it was discovered, in 1789- Andalusia, the region of Malaga in Spain. This unique gem is classed as an aluminium nesosilicate mineral with a thick columnar crystal system. It grows in regional metamorphic rocks that form within the earth under low pressure. While many gemstones look alike- for example topaz, zircon, aquamarine, sapphire, fluorite and apatite- andalusite has a unique appearance that makes it stand out distinctly. Unlike other gems such as tanzanite and iolite which are generally cut by artisans to minimise their colour changes and maximise their vivid hue, andalusite has such a strong pleochroic feature that it is specially cut to enhance its unusual mixture of colour. Andalusite displays a remarkable shimmering dance of hues, especially when cut into faceted shapes. Other cuts bring out a mosaic of blended colours, from green to golden yellow and reddish brown, all intermingled beautifully. Though not very well known and certainly not freely available, andalusite is becoming much sought after amongst those-in-the-know for its unique, striking appearance. These spectacular gems can be described as a ‘cognac cocktail’ of colour, truly a sight to behold and a must-have for lovers of unusual jewellery. This spectacular gemstone weighs 7.5 on the Mohs hardness scale, meaning it is rather hardy and suited to rings which tend to bear the brunt of daily wear and tear. Like most other gems, andalusite has natural inclusions (inner flaws), the most common of which are rutile needles (needle shaped crystals). Other specimens are characterised by dark inclusions which produce cruciform (cross shaped) patterns called chiastolite. Compared to many other quality gems, andalusite is considered to be reasonably priced, although the transparent variety fit for jewellery is extremely rare, so it will command a higher price tag.